Roasting a chicken can be as simple or as complicated as you like. Mine is very simple and no fuss. I pat dry the skin, marinade a chicken with herbs and spices for a few hours, put a generous amount of salt and pepper before cooking in a pan, seal the skin side down first for 3-4 minutes and flip over for another 3-4 minutes. Take the bird out and rest aside while I cook root veggies like potatoes, sweet potatoes, parsnip, etc in the same pan. I transfer them to a baking tray and to the centre rack of the preheated oven (180) for 30 minutes. If you choose to roast the whole chicken, you can add onions, preserved lemon and herbs like thyme inside of the cavity, which adds a beautiful flavour. 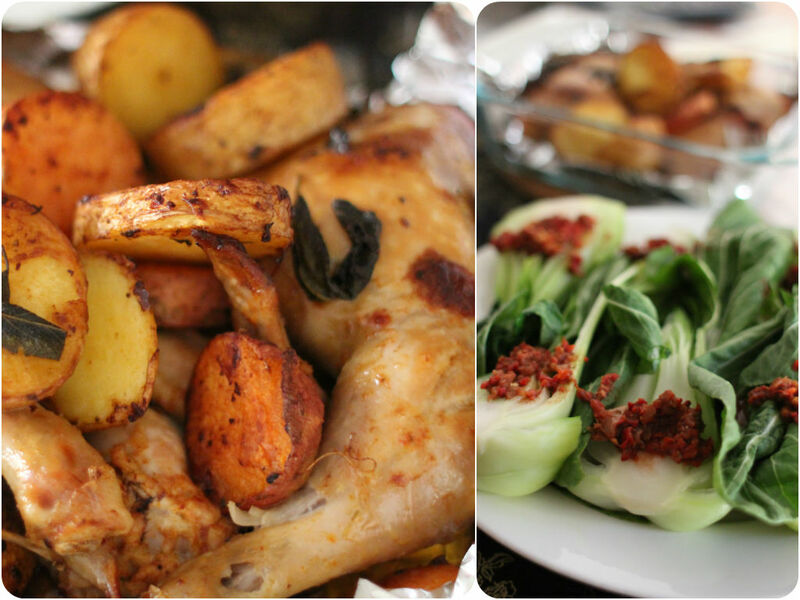 It works for me every time – crispy skin, moist inside, well cooked vegetables on the side. For the Bok Choy, I like my green veggies simply steamed with no added oil for nutrition and crunch. I clean it in the running water making sure there is no dirt left between the leaves. Cut a criss-cross in the stem and stand it up in a bowl of hot water for a few minutes. Then I stir the leaves in a hot water, squeeze to remove an excess water. Serve with a chilli sauce or soy sauce over it before serve. You can absolutely cook in a pan if you like. 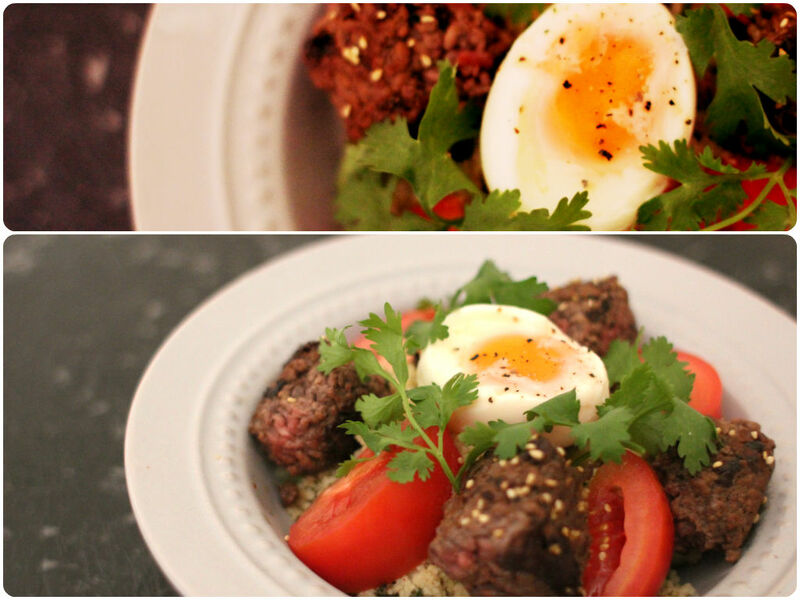 Perfectly Cooked Egg and Meatballs on Couscous Salad Daniel’s dinner tonight after Taekwondo. For the perfectly boiled egg, I place eggs in a pot of cold water, bring it up to boil and cook over medium heat for 6 minutes. Take off the heat and rinse with cold water before peeling off the shell. Beautiful runny creamy egg yolk – yum! For couscous salad, I put a cup of couscous in a bowl, pour two cups of boiling water with a drizzle of olive oil, salt and pepper. Cover it up for about 10 minutes. Carefully fluff with a folk from the top and then add other ingredients. Either cooked veggies or fresh ones work all well with couscous. Sometimes I feel like having a simple Korean meal for lunch or dinner. A bowl of wild rice with some side dishes is a way to go. I might make a miso soup or some protein to go with it if I’m not too lazy. 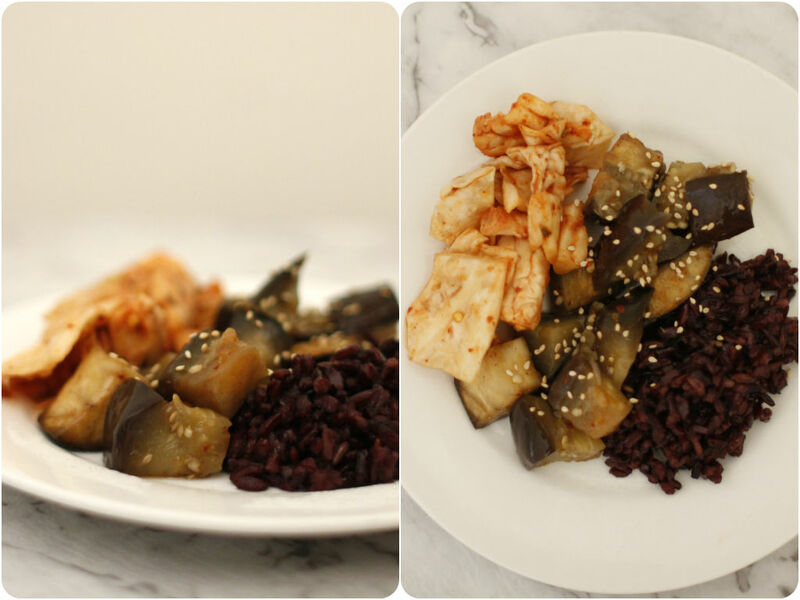 I dice eggplants and braise with a soy sauce, chilli, garlic, ginger, sesame oil and sesame seeds until soft – classic Korean flavour. Kimchi is a staple food for me, always keeping a jar in the fridge. I probably have a Korean food a couple of times a week. A quick vegetarian dinner. Soak the dried beans overnight and cook in a boiling water for 15-20 minutes until cooked. 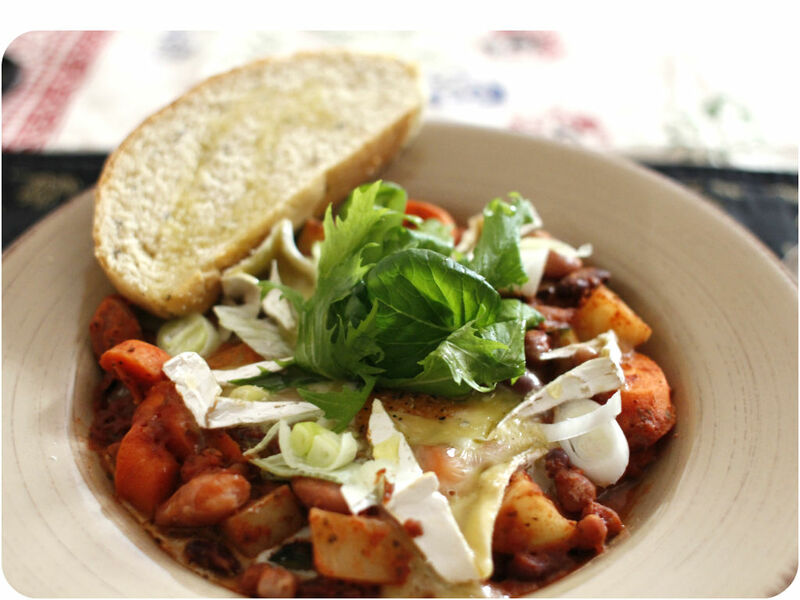 Cook beans and chopped vegetables with passata sauce in a skillet. Season with salt and pepper. Serve with brie cheese, bitter greens and toast. Another vegetarian dish with a full of flavour. 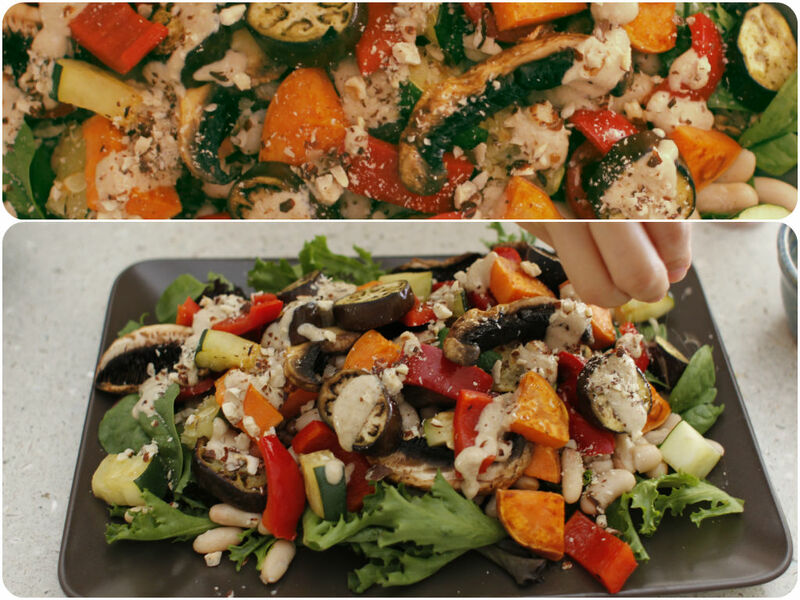 Grill chopped eggplant, zucchini, sweet potato, mushrooms and capsicum. Season with salt and pepper. Arrange them on a bed of white beans and green salad. Drizzle a tahini dressing all over and sprinkle hazelnuts before serve.